If you don’t already know, my daughter Hailee is my girly girl. She has had a passion for fashion, makeup, and all things girly since she could talk. She takes the longest to get ready in the morning and more than once I have found nail polish spilled on a dresser she used to give herself a mani. 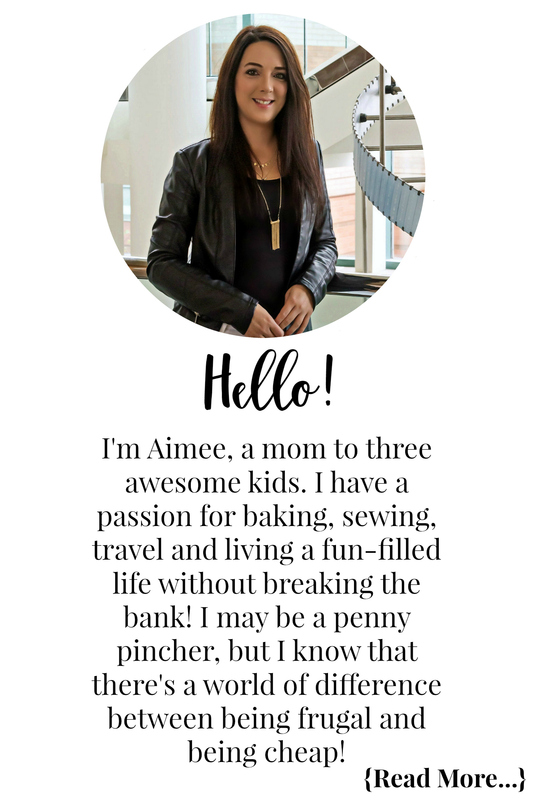 I am always on the lookout for new fun yet educational products that incorporate her love for fashion and beauty. To say Hailee was ecstatic when she found out that more cool Project Mc² kits were included in our spring/summer MGA Entertainment toy box program we were doing is an understatement. Both of the Project Mc² science kits looked so fun we had to flip a coin to decide which to do first! This is the last review for the toy box program and as sad as we are that it is over, we have had a lot of fun. We have already reviewed L.O.L Lil Outrageous Littles, Little Tikes Waffle Blocks, Gel-a-Peel kits, and now the two new Project Mc² science kits. Project Mc² incorporates S.T.E.A.M learning in all their products. From their dolls to their science kits, the science, technology, engineering, art, and math learning is incredible. Not only are the new Project Mc² science kits educational, they are so fun. They make the perfect activity for rainy days as well as the perfect gift for any beauty obsessed girl! So after flipping the coin it was set that we would experiment with the Project Mc² Crayon Makeup Science Kit first. Hailee loves makeup, there have been times I have turned around in the van on the way to a family function and there is my girl with the brightest red lipstick I have ever saw! Bless her heart, she would make an amazing beauty and fashion blogger one day! 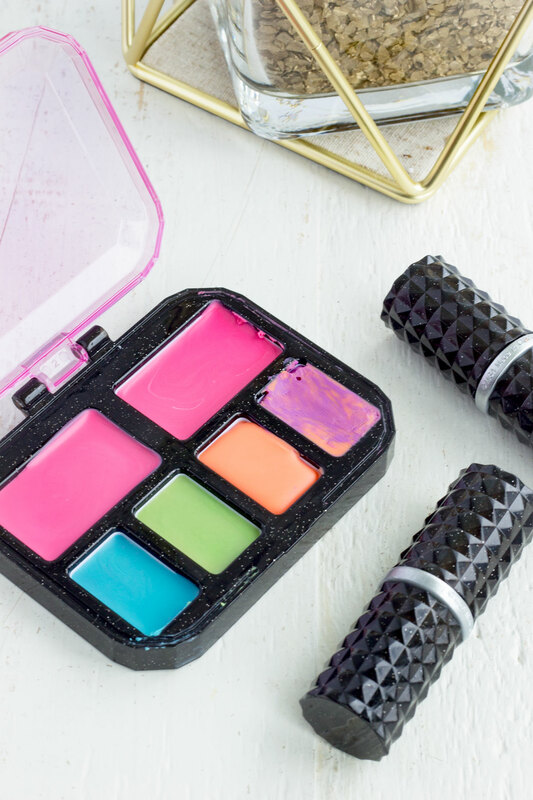 The kit comes with nearly everything you need to make some fun makeup with your daughter. 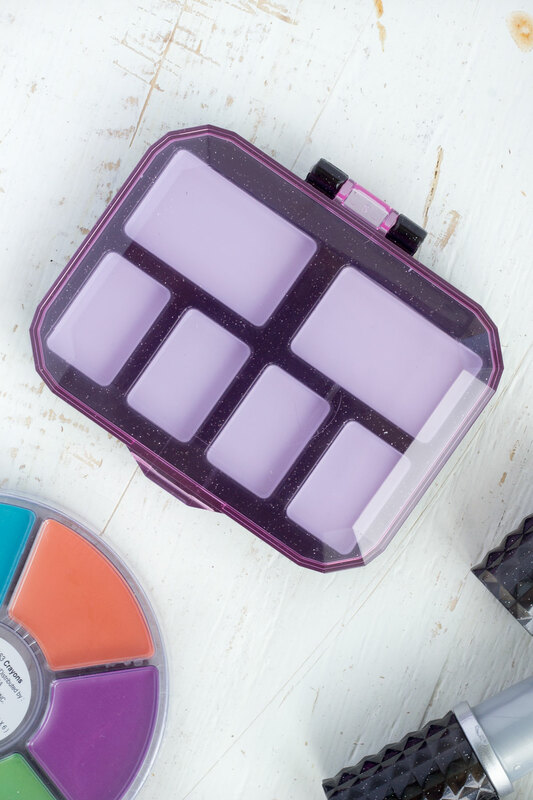 It comes with a compact with 6 compartments, two lipstick holders, a lipstick mold, a colour wheel of crayon wax to get you started, and instructions. 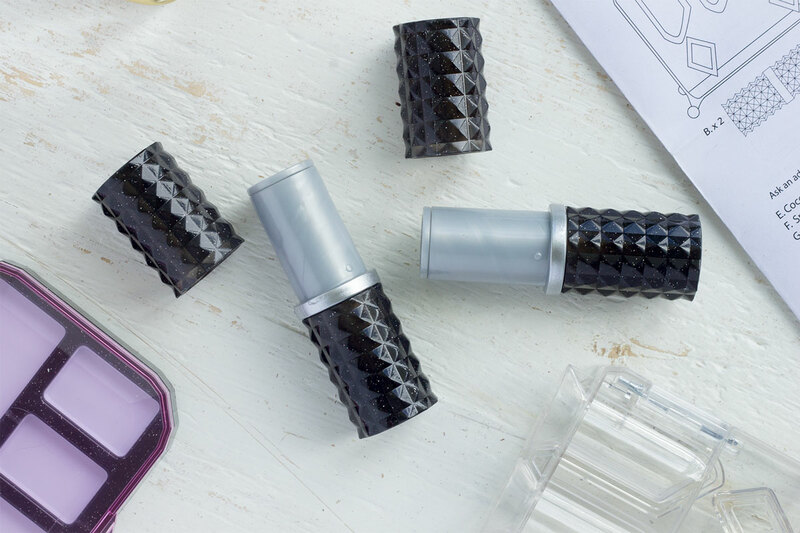 The lipstick containers are so stylish, and they twist up and down just like real lipstick containers. 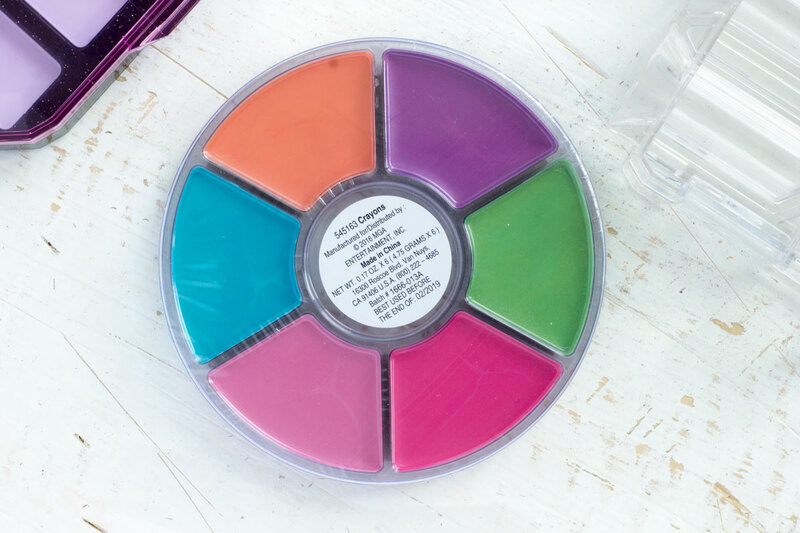 The compact is the perfect size to hold 6 different makeup creations. They give you a great choice of colours to start. When you run out of them you can simply use quality crayons you have at home. The lipstick mold is so cool. Don’t tell Hailee, but I think I may use it to mold some sugar lip scrub sticks for myself! One thing I hate is when I buy something and the instructions are not clear or minimal at best. This is not the case with Project Mc² products. 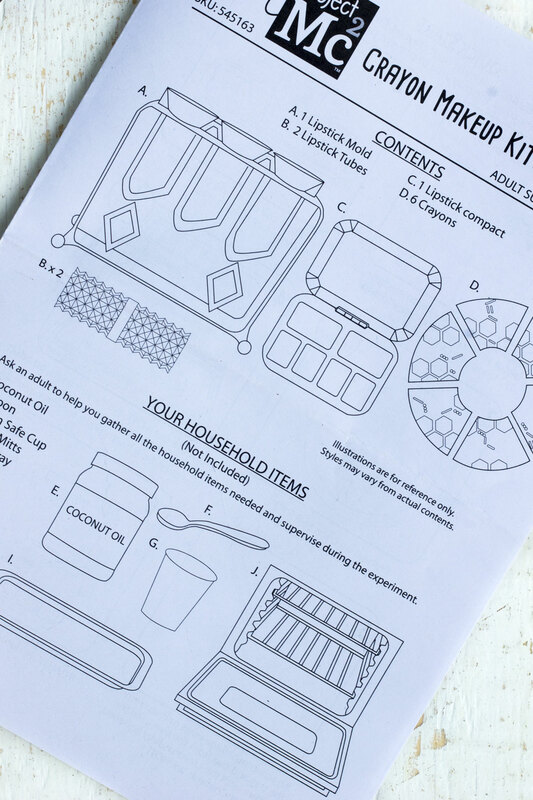 They always give detailed, step-by-step instructions that are easy to follow. Hailee was eager to get this party going so I didn’t have too much time to think things through. You’ll see what I mean after a few scrolls! So to make the makeup you just need a few small oven safe dishes, a baking sheet, some coconut oil, and the crayon wax. 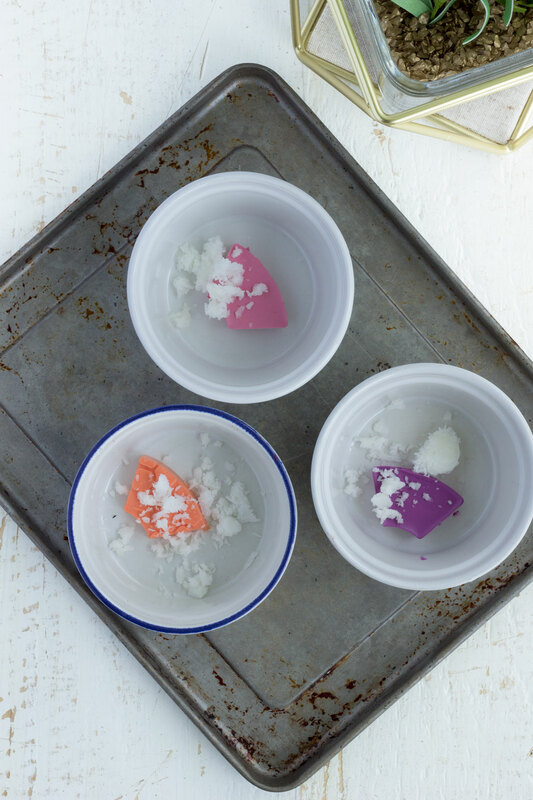 You add 1/2 teaspoon of coconut oil per each cube of crayon wax. Pop it in the oven at 350 for 10 minutes and you are ready to go. One thing I will note, if you have a dish with a spout to pour your hot wax into the molds with once it is melted I suggest doing so. I poured ours straight from my oven safe dishes and made quite the mess. Learn from my mistake and once your colours are melted quickly transfer into a spouted container and then pour into the molds. See, I told you I made a mess! I did my best to clean it up for the pictures. 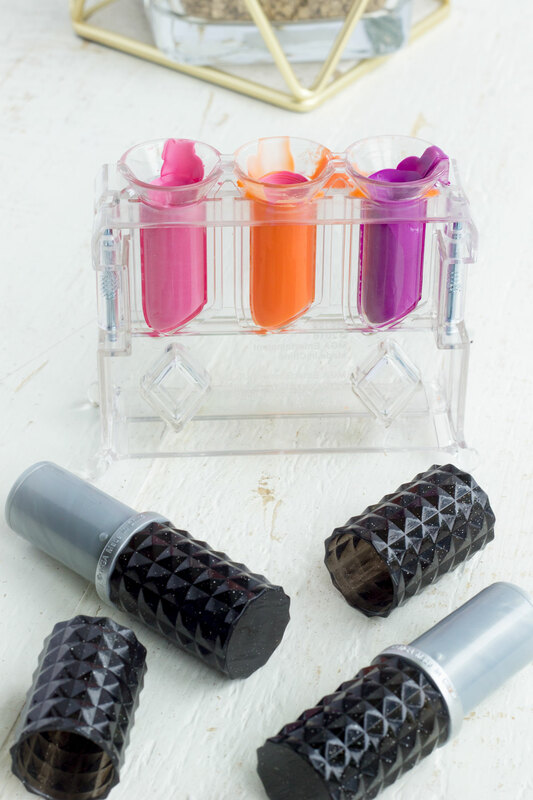 To make lipsticks you pour your melted wax into the mold and let harden. 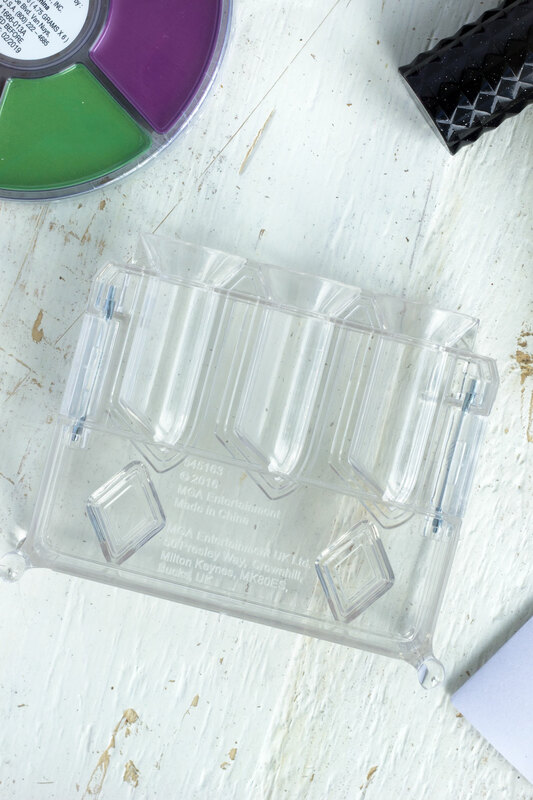 Once hardened you can open it up, pop out the lipstick, and place it in the lipstick holders. More proof of my mess, the peachy colour poured into the purple. I tried to play it off like we intended to make it marble, but we totally didn’t! It actually turned out to be Hailee’s favourite and she insisted on swatching it before I took my photo. If there is one thing I am horrible at, it is doing nails. Forget making cool marble effects or little designs, I can barely paint just plain polish without getting it everywhere. I blame my hands that have a permanent shake! Thankfully this is a no fail way for my daughter to get creative and design her nails with little clean up. 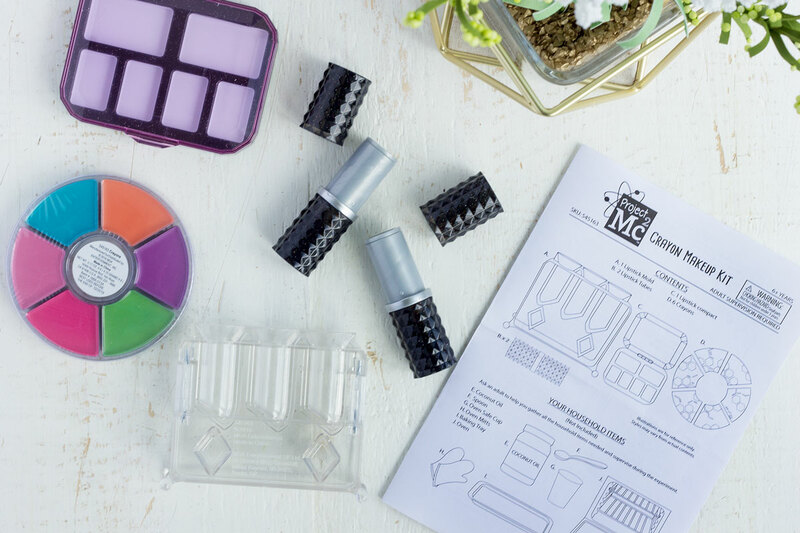 The Project Mc² H20 Nail Science Kit comes with nearly everything you need to create amazing nail art. Included in the kit is the nail art station with nail dryer, beaker, 4 pipettes, 1 design tool, 3 nail discs, 36 adhesives, and 3 nail polish stands. Dropping in the different coloured polishes, one after the other to create a multiple ringed target. Using the design tool to create your desired design. And then drying your nails! I will have to update this post with some of Hailee’s designs when she gets home. She has been spending most of the summer with her grandparents and took her kit with her. She has sent me pictures of some of the designs she has done but they are the quality of her old iPhone 4. Hailee prefers to design right on her own nails vs using the false nails that come with the kit and said it works just as good. 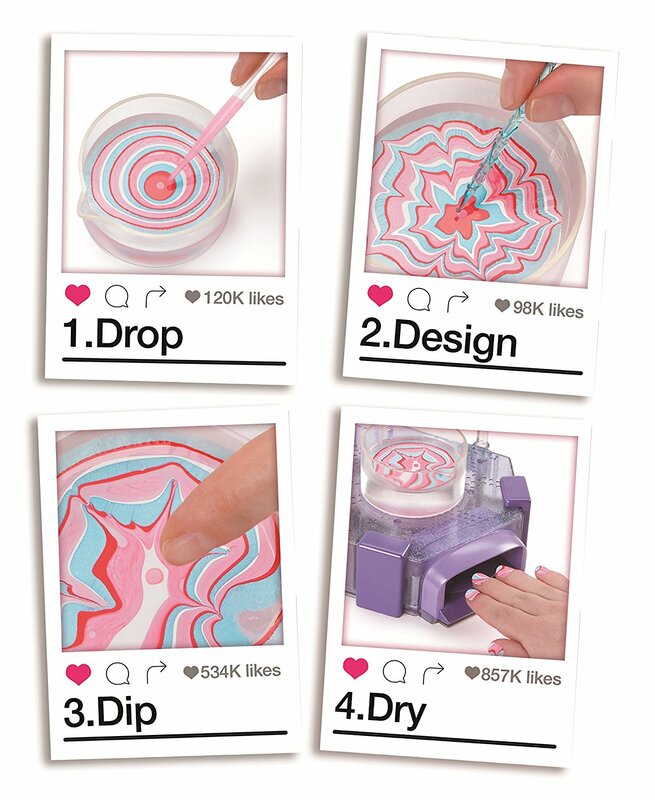 If you have a little girl who loves having her nails painted she will surely love the Project Mc² H20 Nail Science Kit. Like the Project Mc² Crayon Makeup Science Kit the Project Mc² H20 Nail Science Kit is a perfect gift idea for girls. 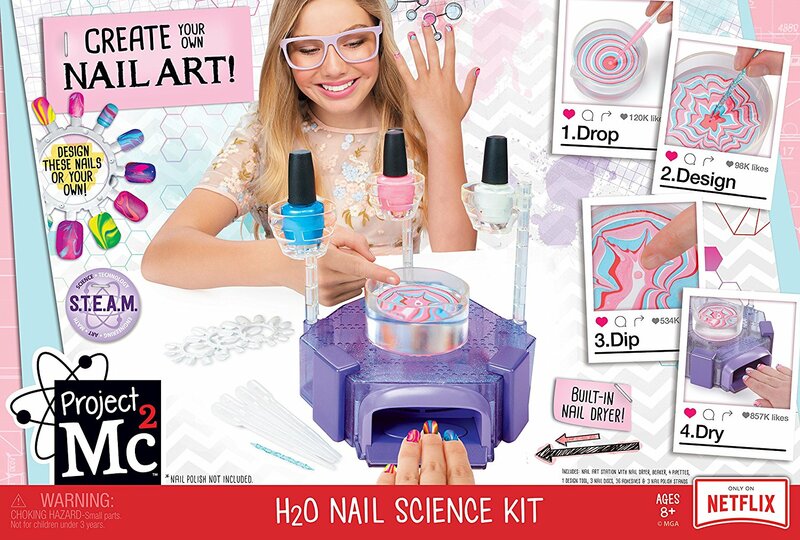 Buy the Project Mc2 H2O Nail Science Kit on Amazon. Buy the Project Mc2 Crayon Makeup Science Kit on Amazon. For updates and more be sure to follow Project Mc² on Instagram, Facebook, Twitter, and YouTube! Stay tuned as MGA has generously sponsored an amazing giveaway for each of the products we have reviewed through the program! Disclosure: Although we were sent product for review consideration, the opinions and language are all my own, and in no way do they reflect Project Mc². Any product claim, statistic, quote or other representation about a product or service should be verified with the manufacturer, company, provider or party in question. That is such a cool project kit! That would be not only educational but fun! Yoyr Hailee sounds like my Hailey but mine is 3 and cant get into much yet I may buy this however as a fun mommy daughter project to do solo with her as she is craving one on one time since baby sister was born! Thanks ! Nice! I love that they are finding ways to mix fun and education together. There are so many cool toys these days,my favorite are the fun/educational ones!